On January 30, 2015, the Supreme Court while hearing a Special Leave Petition for bail for two jailed Maruti workers, Sunil Kumar and Kanwaljeet, gave the Haryana government two weeks to respond why the workers should not be granted bail. SC had on 17 February 2014 declined to hear the workers’ bail plea as eye-witnesses were still being examined. It asked the Haryana court to complete examine eye witnesses by April 2014, though the local court later missed this deadline. Below is a report from August 2014 on the legal case against a majority of the workers. Manesar (Haryana): On Thursday, 147 workers of Maruti Suzuki India Limited (MSIL) in Bhondsi jail will be waiting patientlyfor the decision of the High Court of Punjab and Haryana on bail plea of two of the 147 workers. They have been in jail since two years after manager Awanish Kumar Dev was killed in an instance of rioting in Maruti‘s Manesar plant on 18 July 2012. The rioting in July 2012 was preceded by months of strikes by the workers demanding an independent union in 2011 that had caused a loss of over Rs 2500 crores to MSIL, India’s largest automobile manufacturer. While all 147 workers have been charged on eighteen counts, including rioting charges, and under Section 302 of IPC for murder of Mr Dev, a pattern has emerged from the evidence against the workers. In case of 89 workers, the Haryana police cited the testimonies of only four labour supply contractors hired by the MSIL. Each contractor has testified to witnessing workers indulge in violence such that the names of the workers allegedly seen rioting fall in an alphabetical order. Court documents show witness Virendra alias Rajender Yadav has named 25 workers such that all workers’ names fall in the alphabetical range of A-G. Another witness contractor Yaad Ram testified that he saw 25 workers rioting all of whose names fall in the next range G-P. Witness Ashok Rana names 26 workers who were allegedly rioting whose names range from P-S.The final witness Rakesh of Tirupati Associates who supplied 900 contract workers to MSIL testified to allegedly seeing 13 workers whose names, continuing the alphabetic sequence, are in the range S-Y. On July 5 in the district court, all four contractors failed to identify any of the 89 workers named by them. “The management had originally named 52 persons in the FIR, mainly from the union’s body. The police picked up another 100 workers over the next two-three weeks and assigned 89 names alphabetically to the labour contractors with there being no other witnesses. They did not produce any witnesses at all against another 11 workers,” said defence counsel RS Hooda commenting on the evidence against 100 of 147 workers. Special Public Prosecutor KTS Tulsi declined to comment on this pattern of the testimonies. Witness Virendra alias Rajender Yadav who has named workers with names ranging from A-G told The Hindu that his firm VGR Engineer Pvt. Ltd. supplied 700 workers to the Manesar plant in July 2012, and at present it supplied 600 workers to MSIL’s Gurgaon plant. As rioting weapons, the police show they have recovered 139 car door frames and iron rods from workers weeks after the incident. For instance, they show Maruti Suzuki Workers Union’s head Ram Meher was arrested 13 days later on August 1, 2012. The Recovery Memo records that a car door frame over 2 feet in length, with sharp metal planks welded at both ends allegedly used as rioting weapon was found inside his bed in his residence in Ashok Vihar, 25 km from the Manesar plant. Similarly, they show Sarabjeet, the Union’s General Secretary, was arrested on August 1, 2012 and a car door frame recovered from inside Sarabjeet’s bed at his Laxman Vihar house, 22 km from the Maruti plant, was the alleged weapon. Inside Bhondsi jail, 15 km from Gurgaon, Ram Meher said the pattern was repeated for several workers. “The police say we hid and carried door frames for kilometres, in some instances till another district. How could have we? The police planted these and showed arrests after many of us surrendered,” said Ram Meher. “The alphabetic order of witness is a matter of probability. It is less probable but not impossible. I cannot comment on other details as I was not the DCP in charge at that time,” said DCP (South) Gurgaon Vivek Sharma. 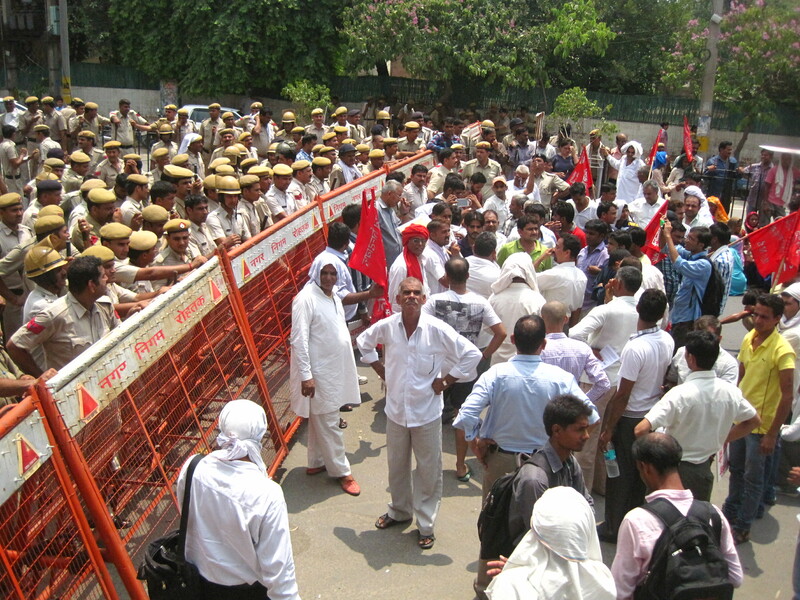 The District Court in Gurgaon has already rejected the workers’ bail plea thrice, most recently this June. The High Court turned it down in May. A video I shot in February when Maruti workers declared their union at Maruti Suzuki India Limited’s Manesar plant in Haryana. My recent posts on Kafila on Maruti, and other instances of workers-employers’ conflict in Delhi-Gurgaon region are here and here.